Sanibel Island Real Estate, Captiva Island Real Estate - Sanibel Summer Fun! Sanibel Island Has Lots To Do! 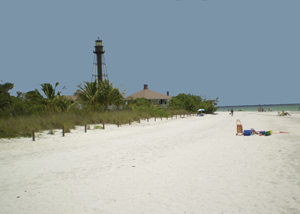 You might think Sanibel summers are slow, with not much to do. That's not the case! For island events you can check out the calendar of events posted through our Chamber of Commerce - Here. With fewer people on-island you can enjoy our beaches and historical sites without the crowds from the winter months. Just to name a few fun things locals enjoy, we can start with the Historic Sanibel Lighthouse at the east end of the island. This lighthouse has quite a cool history! Did you know this was the first lighthouse on the west coast of Florida? It was completed in 1884. You can learn more about ou lighthouse Here. Of course our J.N. Ding Darling National Wildlife Refuge is world famous and absolutely worth the visit. The Refuge has a welcome center that tells the history of Ding Darling and the Refuge. Eight miles of walking/biking trails can fill your day, and bird watching in the Refuge is fantastic! You can watch Roseate Spoonbills feeding in the ponds, as wall as a gator or two sunning along the road. They also offer tram rides as well as daily events for adults and children to participate. You can read more about it Here, and watch my short video (left). I know it's warm out there, but a nice bike ride is always fun. Especially on Sanibel Island! We have over 20 miles of bike/walking trails throughout the island. You can also detour through the numerous preserve property trails. You can get to just about all of our restaurants as well as biking to our local shops. You can go Here to see a map of Sanibel's bike trails. We can't leave out Captiva Island! You can check out Captiva's unique "Downtown" for some fun shopping, as well as grabbing something to eat at the Mucky Duck restaurant overlooking the Gulf of Mexico. Captiva Island also offers four private marinas that have boat rentals, fishing and shelling guides, and sailboat charters. There is no better way to cool off than to get out on the water! You can go to my "Downtown" Captiva page Here, and check out my Captiva video (left). Our Sanibel Historic Village is another fun thing to do with the kids. They are closed for a few months in the summers so give them a call before visiting. You can read about the Village Here. Just off our islands you can visit the historic homes of Thomas Edison and Henry Ford. The attached Edison workshop shows many of his amazing inventions! And the landscaping is world renown! Read more about the Edison and Ford homes Here. While you're on the island you might as well check out properties available! You can easily look at what's available through my real estate search page. You can search by price, size, location or map! Easy! Check it out Here. Call me today with any questions and I promise to do everything I can help you.